Humidity, dust, and dirt are the enemy of our invaluable DSLR cameras, lenses and gear. The effects of humidity in our electronics may be very costly. The ideal solution that will save your cameras and lenses from humidity is investing in the best electronic dry boxes. After my own tests and extensive research, I come up with this list of top 10 best electronic dry cabinets you can buy. As the leading brand of dry cabinets currently, the design and functionality of this electronically controlled cabinet are incredible. It is spacious enough for DSLR cameras and lenses. It is quiet. You’ll also love the beauty of the design, the see-through doors. This 50L capacity digital control dry box is one of a kind, bringing new advanced features to the market that allow for storage of more. This is the best storage of anything that is affected by humidity. A keener focus on the design is what sets this 50L electronic dry cabinet apart from the others. Its durability is remarkable. 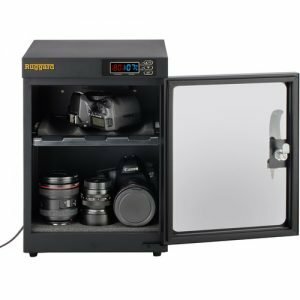 The final cabinet in this group of the best dry cabinets is the 50L capacity Teej dry cabinet whose sole purpose will be to keep your expensive camera free from the effects of humidity. This dehumidifying dry cabinet has a built-in automatic control the humidity, which is essential for most photographers. In addition to storing your digital cameras and lenses, you can actually use this cabinet box to keep your paintings, paper money, stamps, old books, leather, antiques, and musical instrument. 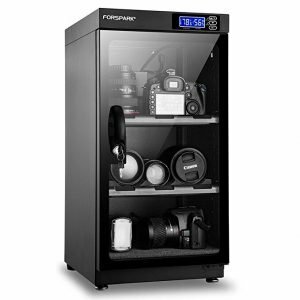 If you want a big dry cabinet to keep as many cameras and lenses as possible, then this Forspark cabinet is the best choice. Energy saving, the 210L Electronic Dry Box Cabinet operates quietly. What’s more? With two doors, it’s easy to use with automation number control. It’s simple and functional. With this size, photographers can easily move it whenever needed. Small size? Not really, you can actually store two DSLR camera bodies, 4 lenses, and some others valuable items. As your collection of DSLR cameras and lenses is your life-time investment, get the best electronic dry cabinet to safeguard them. Before buying one of the best electronic dehumidifying cabinets I listed here, one thing for sure to consider is the size. It matters a lot. You should think of it as a long term investment.